Recognize this beauty? 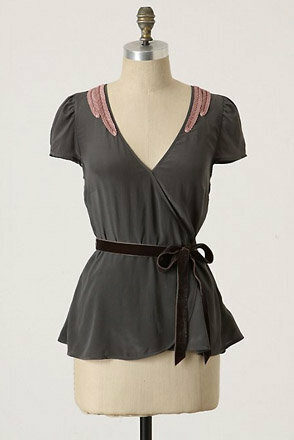 It’s the blouse Alice wears at the beginning of Breaking Dawn, spotted courtesy of Coolspotters.The blouse is grey silk with feather epaulets and a velvet ribbon, and it retailed for $98 in 2010. Because it’s been out of stores for a while it may be difficult to find, and I’ve never seen it on eBay. Reviews on Anthropologie’s website also suggest that it runs large, so you may want to size down for this one if you’re lucky enough to find it. That is such a gorgeous top. I’d grab it in an instant if I could find it (assuming of course it was also magically within my budget). Thank you so much for posting the details.